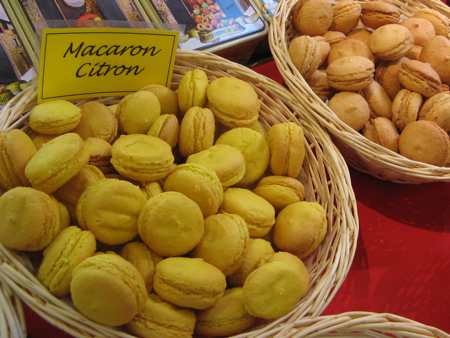 Home / European / WanderFood Wednesday: The Best Market in France? 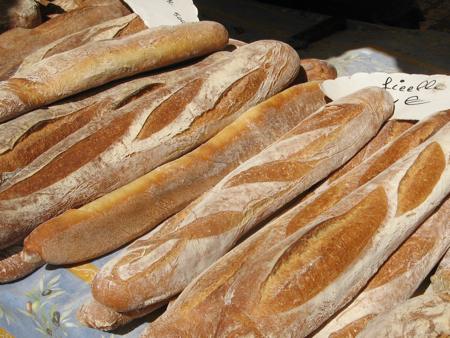 WanderFood Wednesday: The Best Market in France? I’m just back from a bicycling trip in the Dordogne region of southwest France. Along with six friends, my husband Alan and I started our days with pain au chocolat, cycled till it was time for a picnic or an apéritif, and supped on more duck and goose than I’ve eaten in my entire life. Our foodie fun started even before we picked up our bikes. 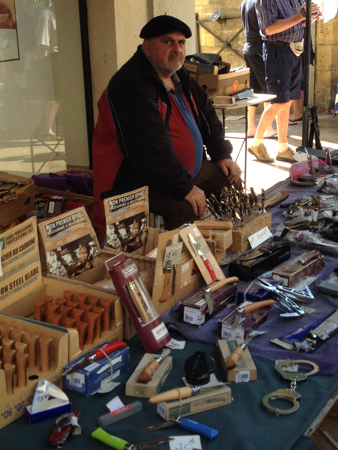 We spent our first morning in the town of Sarlat, which has an excellent outdoor market. 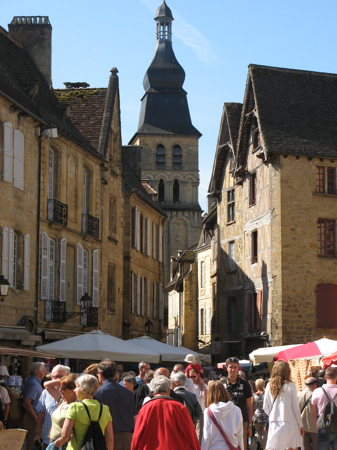 Sarlat’s Saturday market takes over nearly every street in the town’s medieval center. It’s definitely touristy, but you can find plenty of local treats. 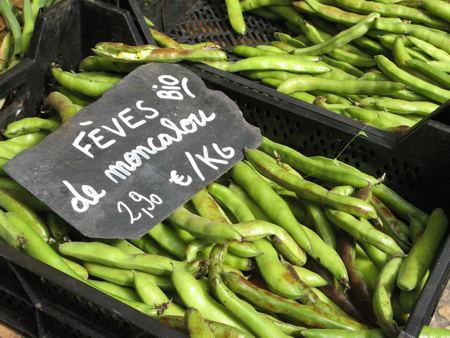 These fava beans were so fresh that we ate them raw. Delicious! 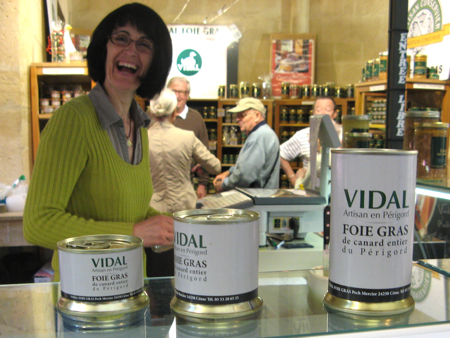 Duck and goose confit, pâté, and foie gras are specialties of the Dordogne region. 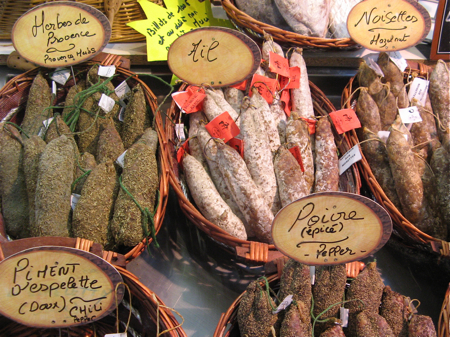 Saucissons (cured sausages) come in many varieties, from hazelnut to garlic to fig (my favorite). Of course, there are sweets, too. Besides food, vendors sell clothing, books, textiles, and all kinds of gadgets. Our friend Susan, who woke up at dawn, bought a stylish linen jacket and a sunny yellow tablecloth before the rest of us had even finished our first cups of café au lait. 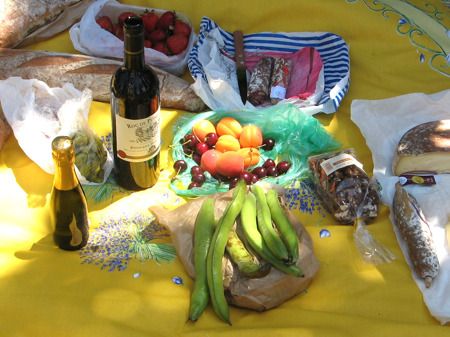 Our market haul made a wonderful picnic lunch. Post a food photo or story on your blog. Include a link to WanderFood Wednesday. 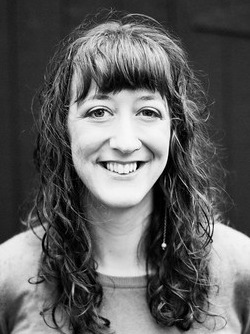 Add your blog name and post title to the “Mr. Linky” form below, with a link directly to your post. That’s it! Sarlat is in the Dordogne-Périgord region of southwestern France, about a six-hour train trip from Paris. Both Lonely Planet and Fodor’s have useful online guides to the area. And if you’re still wondering about the location of last week’s local food destination, no, it’s not France. Watch for an upcoming post when all will be revealed!